For at least a week the neighbors at Sky Acres have had a trio of deer in their gardens. I first saw the three on 15th Ave NE near where Guitarville used to be. They must have successfully crossed the street and come up the hill to 10th Ave. I have lived in my house 50 years and this was a first. 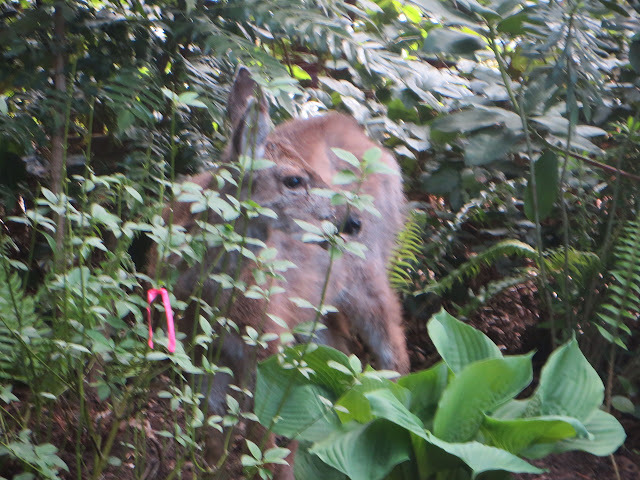 After several days of nibbling, the one deer I had in my garden moved on. Hurray for Mother Nature ability to survive in spite of all the obstacles we put in her way! Rabbits and now deer in North City neighborhoods! A few years ago a bear from Ballard worked its way through Shoreline - what might be next? ?